As per the Legends, A Brahmin by the Name Kesavaiah was childless and used to visit holy shrines with his brother-in-law Govindudu. Kesavaiah had promised Govindudu at the premises of Lord Narayana in Kasi that he will give his daughter to Govindudu for marriage. Kesavaiah was blessed with a baby girl and named her AkkaLakshmi. When Akkalakshmi attained the age for marriage, Govindudu expressed his interest in marrying her. Kesavaiah discarded hi proposal and asked him for the witness. 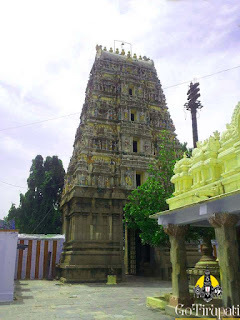 Govindudu went to Kasi and prayed Lord Vishnu to act his witness. Impressed Lord Narayana manifested in Ponnur and acted as the witness for the Kesavaiah's promise. Hence, the name Sakshi Bhavanarayana Swamy. It is also said that Lord Siva also came along with Narayana as the witness and manifested here.